IMRAN, M. , HARVEY, B. A. A novel secure and robust image watermarking technique for color images is presented in this paper. Besides robustness and imperceptibility (which are the most important requisites of any watermarking scheme), there are two other challenges a good watermarking scheme must meet: security and capacity. Therefore, in devising the presented scheme, special consideration is also given to above-mentioned requirements. In order to do so, principal component analysis is involved to enhance imperceptibility and the unique utilization of singular value decomposition is done to achieve better performance in regard to capacity and robustness. Finally, a novel method is proposed to select constituents of an image for watermark embedding, which further improves the security. As a consequence, four essential requisites of a good watermarking scheme are achieved as visible from experimental results. To measure the behavior of presented watermarking scheme, a number of experiments were conducted by utilizing several color images as host images and as watermarks. The presented technique is compared with the latest available watermarking techniques and attained better results than them. T. Mayer, "The politics of online copyright enforcement in the EU", Springer, pp. 25-36, 2017. J. Ouyang, G. Coatrieux, B. Chen, H. Shu, "Color image watermarking based on quaternion Fourier transform and improved uniform log-polar mapping," Journal of Computers & Electrical Engineering, vol. 46, pp. 419-432, 2015. C. S. Chang, J. J. Shen, "Features classification forest: A novel development that is adaptable to robust blind watermarking techniques," IEEE Transactions on Image Processing, vol. 26, no. 8, pp. 3921-3935, 2017. Q. Su, Y. Niu, H. Zou, X. Liu, "A blind dual color image watermarking based on singular value decomposition," Elsevier Journal of Applied Mathematics and Computation, vol. 219, no. 16, pp. 8455-8466, 2013. Q. Su, Y. Niu, X. Liu, T. Yao, "A novel blind digital watermarking algorithm for embedding color image into color image," International Journal for Light and Electron Optics, vol. 124, no. 18, pp. 3254-3259, 2013. B. Chen, G. Coatrieux, G. Chen, X. Sun, J. L. Coatrieux, H. Shu, Full 4-d quaternion discrete Fourier transform based watermarking for color images, Journal of Digital Signal Processing, vol. 28 pp. 106-119, 2014. N. M. Makbool, B. E. Khoo, "A new robust and secure digital image watermarking scheme based on the integer wavelet transform and singular value decomposition," Elsevier Journal of Digital Signal Processing, vol. 33, pp. 134-147, 2014. H. Qi, D. Zheng, J. Zhao, "Human visual system based adaptive digital image watermarking," Elsevier Journal of Signal Processing, vol. 88, no. 1, pp. 174-188, 2008. A. Roy, A. K. Maiti, K. Ghosh, "A perception based color image adaptive watermarking scheme in ycbcr space," International Conference on Signal Processing and Integrated Networks, pp. 304- 317, 2015. R. Liu, T. Tan, "An svd based watermarking scheme for protecting rightful ownership," IEEE Trans. on Multimedia, vol. 4, no. 1, pp. 121-128, 2002. C. C. Lai, C. C. Tai, "Digital image watermarking using discrete wavelet transform and singular value decomposition," IEEE Trans. on Instrumentation and Measurement, vol. 59, no. 11, pp. 3060-3060, 2010. K. Loukhaoukha, Comments on a digital watermarking scheme based on singular value decomposition and tiny genetic algorithm, Elsevier Journal of Digital Signal Processing vol. 23, no. 4 pp. 1334, 2013. X. P. Zhang, K. Li, "Comments on 'an svd based watermarking scheme for protecting rightful ownership," IEEE Trans. on Multimedia, vol. 5, no. 2 pp. 593-594, 2005. C. C. Lai, "A digital watermarking scheme based on singular value decomposition and tiny genetic algorithm," Elsevier Journal of Digital Signal Processing, vol. 21, no. 4 pp. 522-527, 2011. R. Rykaczewski, "Comments on 'an SVD based watermarking scheme for protecting rightful ownership," IEEE Trans. on Multimedia, vol. 9 no. 2 pp. 421-423, 2007. E. Yavuz, Z. Telatar, "Comments on 'a digital watermarking scheme based on singular value decomposition and tiny genetic algorithm," Elsevier Journal of Digital Signal Processing, vol. 23 no. 4 pp. 1335-1336, 2013. 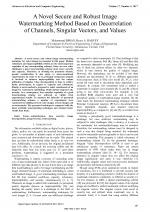 R. Vidal, Y. Ma, S. S. Sastry, "Generalized principal component analysis", Introduction, Springer, pp. 25-54, 2016. B. K. Gunturk, X. Li, "Image Restoration: Fundamentals and Recent Advances," Taylor & Francis Group, pp. 168-172, 2013. B. Schauerte, "Multimodal computational attention for scene understanding and robotics," Springer, pp. 115-175, 2016. S. Jayaraman, S. Esakkirajan, T. Veerakumar, "Image Enhancement", in Digital Image Processing, McGraw-Hill Education, pp. 243-297, 2011. C. S. Chang, J. J. Shen, "Feature classification forest: A novel development that is adaptable to robust blind watermarking techniques," IEEE Transaction on Image Processing, vol. 26, no. 8, pp. 3921-3935, 2017. 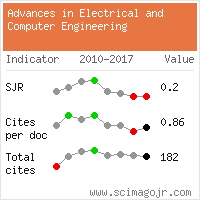 Citations for references updated on 2019-04-22 05:24 in 140 seconds.